Good news! After the success of my faster no knead bread I wondered if the same concept would work for my pan pizza. It does. The original easy pan pizza recipe, which is the most viewed video on my youtube channel, is a really easy recipe but you have to start the dough the night before and let it stand overnight. The result is an amazing crust that everyone has raved about but now, you don’t have to start it the night before. All you do is use hot tap water instead of cold water (the original recipe calls for cold water) and you can start the pan pizza the day you want it. I’m so excited about this. Simply by switching from cold water to hot tap water (not boiling), you reduce the overnight rest of 12 hours to only 3 hours. Here’s what to do: Use the same exact recipe but use hot water instead of cold, and instead of letting it rest overnight on the counter, you let it rest for 3 hours on the counter. After 3 hours, you proceed with the original recipe from step #2. There it is. My faster easy pan pizza. 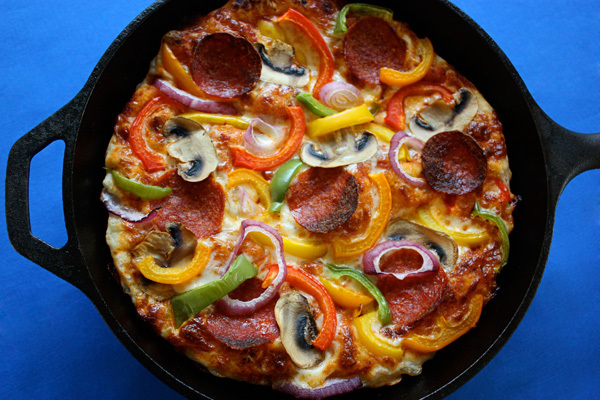 50 Comments on "Easier Faster Pan Pizza"
I made the faster version of this pizza last night with my son. I put the crust together and oversaw the rising etc while he was at work. When he came home I helped him with the rest of it (nice bonding time!) and it was incredible!!! I was so proud of it!! It came out absolutely fantastic and I am NOT a baker – this was only the third time I have tried a recipe for pizza. No need to look elsewhere! My husband, son and I all loved it! It was SO easy and this crust truly rivaled the best Italian restaurants and is by far better than any of the chain restaurants, hands down! Thank you, Jenny! I am so excited to try this recipe…I used to watch you on tv when I was younger… You still look great! I made your amazing over nite pan pizza and absolutely loved it. I am making the 3 hr rise dough tonite. One question. I know you only used 1/4 tsp yeast since it would slow rise all nite, but do you use the same amount for the 3 hr rise? I will never order out again because this crust is identical to my all time favorite pizza hut pan pizza from 20 yrs ago. Can’t get crust like this anymore. There are no changes for the faster version. I tried your pan pizza recipe and I loved it I’m just made my dough for my lunch tomorrow thanks ! As an old guy, I have taken up cooking. I built a fairly elaborate outdoor kitchen and I love to cook. I have several cooking areas and cooking devices. Two devices are Weber 22.5″ kettles. One is set up for cooking steaks, etc., and has a modification to enhance low and slow smoking. The other is modified as a pizza oven (commercially available, but I built my own conversion). Sorry for the long intro, but it is important to my questions. I tried your pan pizza twice. Outstanding both times!! As I type this, I am waiting for my next batch to rise. It is the hot water version that I have not tried before. At the four hour mark, it does not look or feel like the 12 hour version. It seems more like regular dough. I will get my cast iron pan ready and do the rest. I will follow up on the results. Even if I have to sprinkle some flour and roll it out, I’m betting it will be fine. I stumbled across your site on utube not so long ago and I must congratulate you. Your recipes are so easy and quick and yummy. I am definately a fan. Being a single mum working full time, I find your recipes eliminate the hard work for me now. Previously I had to prepare dinner one or two nights ahead. NOW you have made my life much much easier. I now have ME time. Great pizza,however one should never use hot from the tap for cooking because bacteria loves hot water tanks. There’s already bacteria in the dough. It’s called yeast. Once baked, all bacteria is dead. Always got that one guy that’s trying to be Mr. Healthy who has to prove to the world he knows all there is about sterilization and living in an antiseptic world. The pizza is baked in your oven at the highest temperature your oven can provide. Pressure canning foods kills bacteria at 240 deg, so if your oven doesn’t reach 240 deg, you should consider a new oven or get your old one checked out. Can’t bake a loaf of bread or make a pie at 240. You wouldn’t even be able to make Jenny’s Chicken Pot Pie at that temp. Sometimes I just have to shake my head when reading comments. The purpose of using hot water is to speed the action of the yeast. You have to be careful as anything over about 110 degrees F will kill the yeast. I like to use distilled water as the chlorine in tap water is very hard on yeast. No need to worry about bacteria as the yeast will totally colonize the flour mix and do their thing. I am assuming you know the yeast are living creatures??? Actually, up to 130 degrees F does not kill yeast. It’s even the suggested temperature on the package of instant yeast (120-130) while active dry yeast is suggested at 100-110. I have used 120 degree water with active dry yeast and it has never failed. I think the reason for confusion is that years ago yeast was more fragile than the one that’s available today. So that’s good because everyone just learning to bake won’t be afraid to try their hand at bread. Hey Dan, thought you might like this tip. I don’t like drinking chlorine either so I bought a Berkey water purifier and run all my tap water through that. The purifiers are costly but I bought the smallest one and I’m so happy I did. The reason you normally don’t use. Dry hot water isn’t a concern with bacteria, it is a concern that too hot water will kill the healthy yeast bacteria and ruin your dough. Just what is “dry hot water anywho”? Actually, the reason people always said not to use hot water from the tap was that in the olden days, the hot water pipes were often soldered with lead solder and the thought was that the hot water would allow more lead to leach from the solder so that over time, you’d be ingesting enough lead to be sick. Luckily that’s not a problem for most of us even in old houses because the old pipes have long since corroded and been replaced by safer ones. The water in your hot water heater heats up enough to kill the bacteria or you’d also have to be cleaning algae from the tank. rolls yesterday, so good and I am so happy with your cooking. very easy and so successful. Thanks dear funny Jenny. I love you and your recipes. The other day i tried the snowball cookies you made, and the result was amazing. Everybody loved them. But you do not share your videos anymore. All of the people I subscribed to add new videos at least every week, i check your channel on youtube now and then, to see if you came back, and i get disappointed. I love your recipes because they are so simple to make and trusted. I hope you are fine! Jenny, I have been watching your Jenny Can Cook and Jenny’s Kitchen quite regularly these days. I love the way you make cooking / baking so simple yet very attractive. I am now your fan. Your behaviour is so girlish and I love the way you explain things very authoritatively. Great! I promise to try at least a few of your dishes and will let you know for sure how they turned out. How hot should the water be ? My tap water comes out around 130-135 degrees. Hello Ma’am, i have used ur quick rise pan pizza recipe instead of cold water i hve used warm so the dough will be ready in 3 hrs. I had doubled the amount in order to make 2 pizza so how to store this sticky wet xtra dough to make the second pizza the next day. This dough can be refrigerated for up to 5 days. In fact they say that refrigeration improves the flavor. You should let it do the first rest, either overnight with cold water or for 3 hours with warm water, and at that point cover it loosely, giving room for expansion, and refrigerate. Then bring it to room temperature and proceed the the pizza. >This dough can be refrigerated for up to 5 days. In fact they say that refrigeration improves the flavor. You should let it do the first rest, either overnight with cold water or for 3 hours with warm water, and at that point cover it loosely, giving room for expansion, and refrigerate. Then bring it to room temperature and proceed the the pizza. After bringing it up to room temperature, do I put it in the pan and let it rest another hour? Or is it ready at that point for sauce/cheese/toppings? I believe you would let it rest for another hour or two so it puffs up and spreads into the pan. I used the new cookware called “The Rock” and the crust is amazing. Better than any takeout I have ever eaten. I used an olive oil/butter blend to coat the frying pan, or the drippings from the bacon that I have already cooked up in the fry pan. I do not like my dough too thick so one batch does an 11 inch and an 8 inch frying pan. I have also tried your cabbage rolls Jenny and they are delish! Is a non stick frying pan alright or a stainless metal pan? Nothing retains heat like cast iron so it will give you the best crust. It’s not considered safe to heat non-stick pans at a very high heat and as for a stainless metal pan if it’s heavy and oven safe to 500 degrees it might work but I have only used cast iron so I can’t speak from experience. I finally made this pizza. Followed your directions precisely (well I used a bigger skillet) and OMG delicious. That is a Big compliment because 1. I am Italian and 2. I grew up in Buffalo, New York where the pizza is the best (in my opinion). I love your videos. Great job. I don’t know though …..you seem to be getting younger every year. Must be your obvious love of Life. That comment was from another person named Jenny. Can we use ceramic-coated pan here? I think the best result would be in a black cast iron pan (ceramic-coated on the outside is okay, but not on the inside). Just made the Easier Faster Pan Pizza—WOW! What a success. After eating it, my husband requested I buy another buy 10-inch cast iron skillet, so when the boys come home we can cook two at a time. Thanks for making this wife look good!